We attempted to make sugar cookies tonight and by make I mean we cut open the package and rolled out the pre-made dough. The outcome was not exactly what we had in mind. 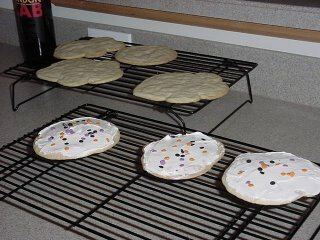 The dough yielded only 10 cookies and each were paper thin. However, the taste wasn't too awful. Edible, but not enjoyable. Why are sugar cookies so complicated? I have eaten the perfect sugar cookie and even have the recipe, but I cannot duplicate them. I've tried. No good. So, I guess it's back to the drawing board for now. Any advice will be appreciated! We suggest you drink an alcoholic drink of your choice. They tend to be a lot sweeter!!!! I've also had those same perfect sugar cookies - I don't know how the hell she does it!?!? I'm guessing the fact her name is Candy helps somehow in the baking...but I'm not sure.